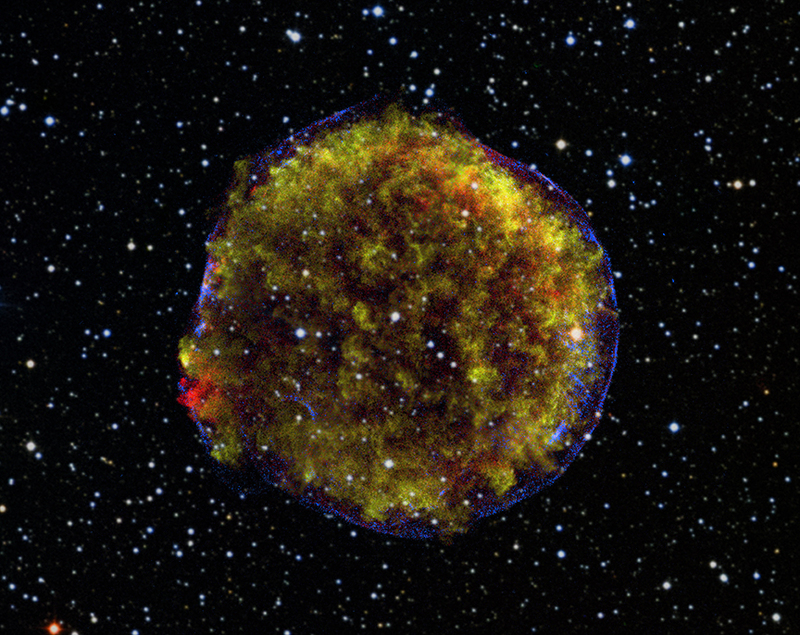 For the first time, a movie has been made of the evolution of Tycho's supernova remnant. This sequence includes X-rays observations from Chandra spaced out over a decade and a half. Tycho belongs to a class of supernovas used to measure the expansion of the Universe so the details of these explosions are very important. By combining the Chandra data with 30 years worth of observations with the VLA, scientists have learned new things about this remnant and its history. When the star that created this supernova remnant exploded in 1572, it was so bright that it was visible during the day. And though he wasn't the first or only person to observe this stellar spectacle, the Danish astronomer Tycho Brahe wrote a book about his extensive observations of the event, gaining the honor of it being named after him. 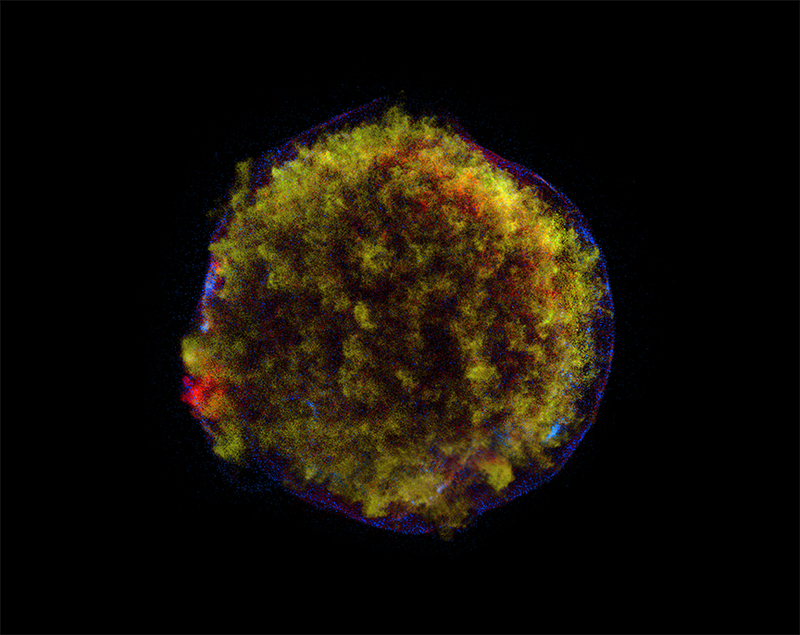 In modern times, astronomers have observed the debris field from this explosion - what is now known as Tycho's supernova remnant - using data from NASA's Chandra X-ray Observatory, the NSF's Karl G. Jansky Very Large Array (VLA) and many other telescopes. Today, they know that the Tycho remnant was created by the explosion of a white dwarf star, making it part of the so-called Type Ia class of supernovas used to track the expansion of the Universe. Since much of the material being flung out from the shattered star has been heated by shock waves - similar to sonic booms from supersonic planes - passing through it, the remnant glows strongly in X-ray light. Astronomers have now used Chandra observations from 2000 through 2015 to create the longest movie of the Tycho remnant's X-ray evolution over time, using five different images. This shows the expansion from the explosion is still continuing about 450 years later, as seen from Earth's vantage point roughly 10,000 light years away. This range in speed of the blast wave's outward motion is caused by differences in the density of gas surrounding the supernova remnant. This causes an offset in position of the explosion site from the geometric center, determined by locating the center of the circular remnant. The astronomers found that the size of the offset is about 10% of the remnant's current radius, towards the upper left of the geometric center. The team also found that the maximum speed of the blast wave is about 12 million miles per hour. 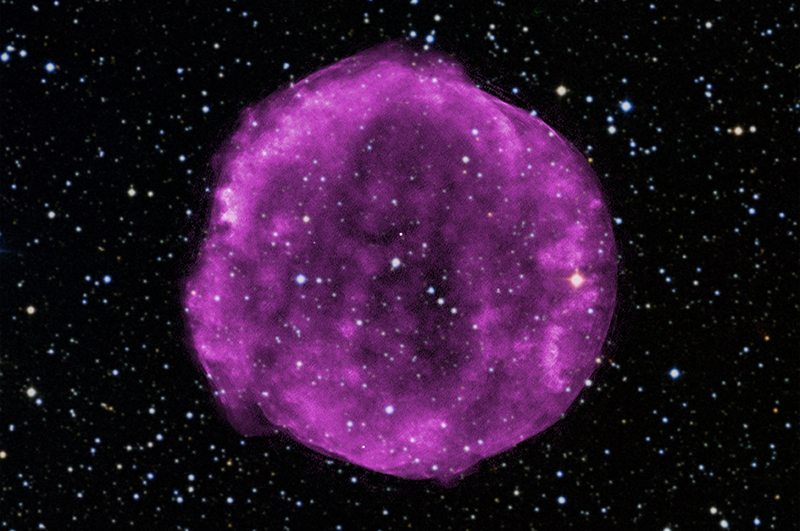 This means that the remnant has expanded by about 100 billion miles during the time Chandra has observed it. The significant offset from the center of the explosion to the remnant's geometric center is a relatively recent phenomenon. For the first few hundred years of the remnant, the explosion's shock was so powerful that the density of gas it was running into did not affect its motion. The density discrepancy from the left side to the right has increased as the shock moved outwards, causing the offset in position between the explosion center and the geometric center to grow with time. So, if future X-ray astronomers, say 1,000 years from now, do the same observation, they should find a much larger offset. A paper describing these results has been accepted for publication in The Astrophysical Journal Letters and is available online. The authors are Brian Williams (NASA's Goddard Space Flight Center and Universities Space Research Association), Laura Chomiuk (Michigan State University), John Hewitt (University of North Florida), John Blondin (North Carolina State University), Kazimierz Borkowski (NCSU), Parviz Ghavamian (Towson University), Robert Petre (GSFC), and Stephen Reynolds (NCSU). I like your things and I think it is really cool to know these things. What is the diameter of the tycho remnant?